Name: Obesity & Your Health: Is Weight Loss Surgery Right for You? Looking to lose weight? Join Drs. 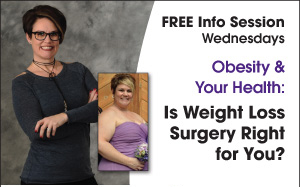 Christopher Joyce and Brian Lahmann, experienced gastric bypass surgeons with Bariatric & Minimally Invasive (BMI) Surgery at Silver Cross Hospital, for a free informational session about Obesity & Your Health: Is Weight Loss Surgery Right for You? The program is held on Wednesdays at 5:45 p.m. at BMI Surgery, Silver Cross Hospital Pavilion A, Suite 260, 1890 Silver Cross Blvd., New Lenox. Participants will learn about the advantages and risks of traditional and laparoscopic bariatric weight loss surgery, including the ReShape® gastric balloon placement, gastric sleeve, and the REALIZE® and LAP-BAND® gastric band systems, and find out who is a candidate for the procedure. Silver Cross and BMI’s weight loss surgery comprehensive program has received national accreditation from the Metabolic and Bariatric Surgery Accreditation and Quality Improvement Program (MBSAQIP). Silver Cross Hospital and BMI Surgery are also and Blue Shield of Illinois Blue Distinction Center for Bariatric Surgery. Register to attend this free informational session online at www.silvercross.org.